thus keeping both sides of the city on his side. Michael Palin - what a top chap! He's educated, well-travelled and cultured. Why in the world would he ever support Sheffield United? I've read his diaries and several times he mentions going to watch Wednesday. We also got a special mention on promotion day in 1984, with him saying how happy he was. Weird, I'd always read he was a Unitedite. I'm sure it used to say so on his Wikipedia page and referenced one of his books for evidence. You should go change the entry if it's still on there Kivo and link to your video as a source. We had 2 successive away trips early 70s, I think he was at them both, QPR & Charlton. When he sat at the front of us, everyone started singing 'The Lumberjack Song' - he loved it! I heard a 5live interview with him and he said he was an oinker. Supports both, leans towards Blades, always mentions us in his documentaries, especially ones from the early 90's such as Pole to Pole. Yes, second volume he mentions taking his son when Wednesday are in London. One time he's at Orient and says Wednesday are all over them and it's only a matter of time before they score. Then Orient score twice...sound familiar? On the way out a car spots him and shouts "Hey, it's Eric Idle"! He occasionally mentions Wednesday in his documentaries. I've only notice him mention Utd once and that was when he asked for their score vs Newcastle (god knows when). 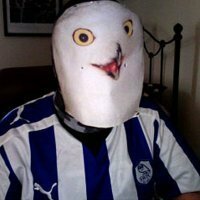 Interests:My family, sheffield wednesday and music. He's a pig, get over it. My Wife finds it very amusing that I always laugh when Sean Bean dies on TV. He's died quite often. Game of Thrones, GoldenEye, Patriot Games and LOTRs from memory. The reason he mentions Wednesday every time he's in the far flung corners of the Earth is because no bugger has ever heard of the other lot...and he knows it...FACT!